Doug Griffith is the chief of party of the Lebanon Enterprise Development Project. His areas of expertise include institutional strengthening and capacity building, policy reform, value-chain strengthening, industry competitiveness, enterprise development, market linkages, and workforce development. 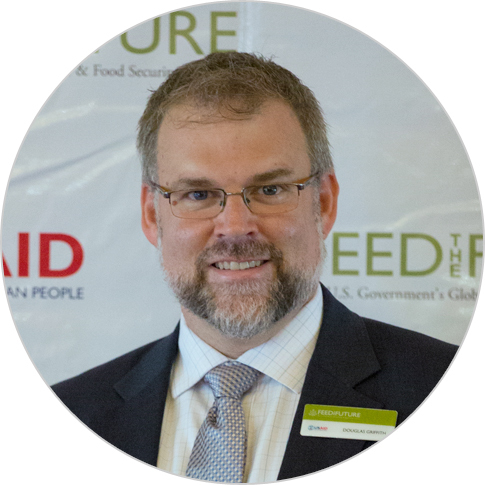 Previously, he served as the chief of party of the USAID/Uganda Feed the Future (FtF) Enabling Environment for Agriculture Activity, which focuses on strengthening agricultural laws and critical agro-inputs, as well as the institutional capacity of organizations involved in commodities like coffee, maize, and beans. Mr. Griffith also served as the chief of party of the Moldova Competitiveness Enhancement and Enterprise Development projects as well as a director in Chemonics’ Europe and Eurasia region. He has designed competitiveness initiatives in Armenia, Kosovo, and Romania and conducted agribusiness sector assessments in Albania, Central Asia, Kosovo, Romania, and South Africa. Prior to joining Chemonics, he worked in mortgage lending in Minneapolis and in the Peace Corps in Niger as a food security volunteer. He earned an M.B.A. and an M.A. in international development from American University in Washington, D.C., and a B.S. in environmental management from Taylor University in Upland, Indiana.